Fava beans,Vicia faba, are a common human food in the Mediterranean regions of Europe. Their potential as a protein supplement for livestock is being explored in the U.S. and Canada. However, fava beans contain the glycosides vicine and covicine. 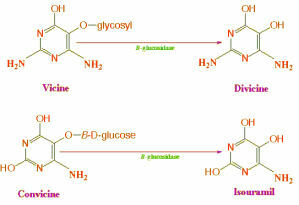 These glycosides hamper the development of fava beans as a worldwide food and feed crop because they cause a disease called favism in people who have an inherited absence of the enzyme glucose-6-phosphate dehydrogenase (G6PD) in their red blood cells. Vicine and covicine and their respective aglycones. More than 100 million people worldwide are genetically deficient in G6PD. People whose red blood cells are deficient in G6PD appear to be more resistant to the detrimental effects of maleria. Thus, this genetic condition is rarely found in populations with little historical exposure to maleria, but instead is concentrated in populations where malaria is prevalent. Susceptible people are exposed to favism either by inhaling the pollen of fava bean flowers or by eating the beans. In people who lack G6PD, divicine, the aglycone of vicine, and isouramil, the aglycone of covicine, cause acute hemolytic either by direct action on the red cell membranes or by producing hydrogen peroxide which in turn breaks down red cell membranes. The enzyme G6PD functions to maintain plentiful supplies of reduced glutathione. Oxidants such as divicine, isouramil, and hydrogen peroxide are normally reduced and rendered inactive by exposure to reduced glutathione. However, vulnerable individuals produce insufficient GSH to block the destruction of red cell membranes by these oxidants. The incidence of this genetic deficiency is as high as 50% in some populations. Prior to the advent of highly effective blood transfusion technology, mortality rates of 6 to 8% were reported in G6PD deficient children exposed to fava beans. Fava beans have detrimental effects on the the metabolism of chickens because of their content of tannins, protease inhibitors, and lectins as well as vicine and covicine. These factors result in lower growth rate and feed efficiency, and enlarged livers and pancreas in chicks, and in poorer feed efficiency in laying hens. Dietary vicine has been shown to cause reduced fertility and hatchability of eggs, decreased egg and yolk weights, fewer eggs, increased plasma lipid and peroxide levels, and heavier livers with increased lipid peroxide levels and decreased glutathione levels in layers. In contrast to the disappointing results of fava beans on chickens, fava bean silage has compared favorably with oat, corn, and field pea silage when fed to ruminants.